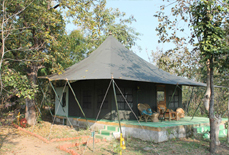 Wildlife safari to spot wild animals like tiger, chital, sambar, nilgai, wild boar, and jackal. You can also spot leopard, sloth bear, wild dog, porcupine, jungle cat, fox, striped hyena, gaur, chousingha and barking deer. 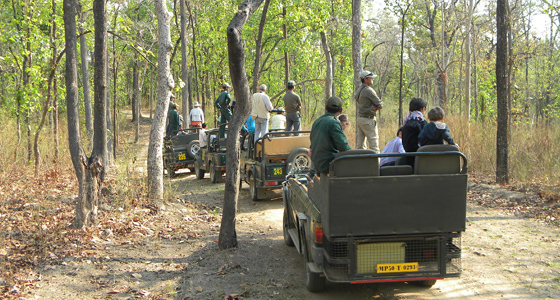 The Nagpur to Pench National Park Weekend Tour Package is made only for those who love to bask in the bonafide wilderness of Indian National Parks. 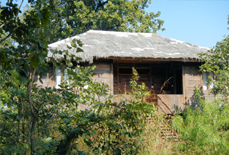 The Pench National Park is spread over an area of 758 square km, and within this cover it cuddles several wild fauna species, including the royal predators; the big cats; the tigers. 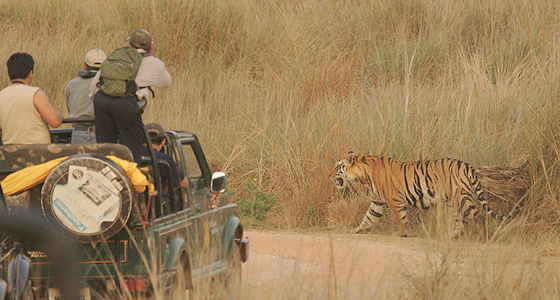 It is the roar of the tiger that is quite sufficient to entice as well as dare the tourists to visit the park. Despite of the fear of this dangerous creature, people can't resist its sight. So, if you are also craving for a mere glimpse of the big beast, let us make your wish come true. On arrival at Nagpur railway station or airport, you will be transferred to Pench. 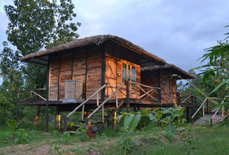 Check into a wildlife resort on arrival. 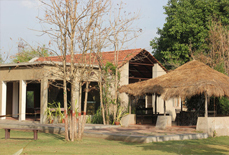 In the evening you can enjoy nature walk in & around the resort. Later at night have dinner, followed by an overnight stay. During this tour, we offer you an early morning and an afternoon jeep safari. 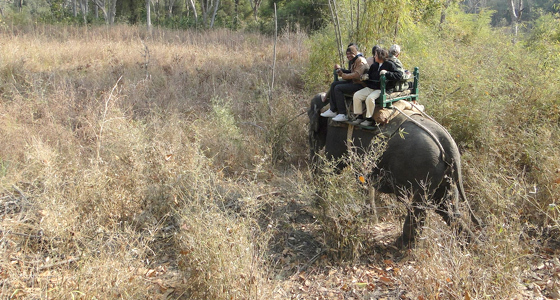 Early in the morning, the jeep will pick you up from the resort and then you can enjoy the sight of different wild animals including the tiger, deer, elephant, gaur, so on and so forth. You can also treat your eyes by viewing the wonderful vistas formed by both domestic and migratory birds. Later, return back to the hotel for breakfast. Post breakfast, again the jeep will make you wander amid the dense forests of Pench. After enjoying the jungle ride, return to the resort and have lunch. In the evening you are free to unwind yourself. 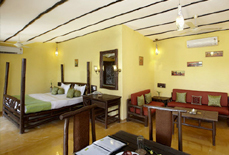 Thereafter, tickle your taste buds with the delectable dinner at the resort, and then have a comfy overnight stay. 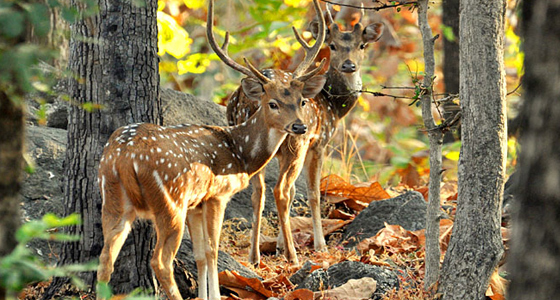 Bestowed with rich fauna and flora, the Pench National Park has always been among the top destinations for wildlife tours. Be it a mammal, reptile, amphibian or bird, every fauna species that defines wildlife at its best can be seen within this park. Though there are several wild beings residing in the park, it is the tiger that stands as the main attraction; that fascinates wildlife lovers; that fetches maximum tourism to the place. 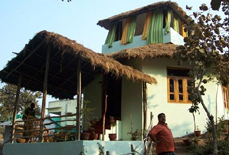 In addition to this, the Pench National Park also has numerous other natural wonders like Nagdeo Pahadi, Totaladoh Dam, Ambakhori Waterfall (Seasonal), Out Fall (Gawali Ghat) and Meghdoot Jalashaya (Pond). Early in the morning the jeep will pick you from the resort, for the last round of jungle safari. After soaking in the wilderness of the park, return to the resort. Enjoy a yummy breakfast and pack your bag for check out. 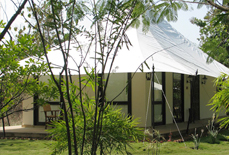 Later drive to Nagpur and upon arrival we will transfer you to the airport, railway station or your preferred hotel.